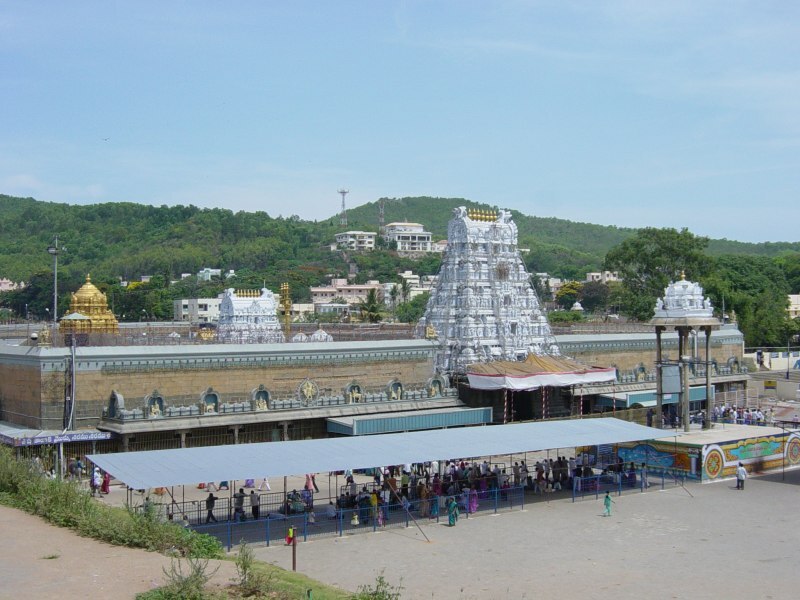 The sacred temple of Sri Venkateswara is located on the seventh peak, Venkatadri (Venkata Hill), and lies on the southern banks of Sri Swami Pushkarini. According to the Puranas, Lord Vishnu stayed on the earth for some time in the Avatar of Swetha Varaham and rose out of pushkarini as Swayambhuva. His spouse Lakshmi Devi appeared in Thirucharnur. This Swetha Varaha Avatharam was installed in the temple situated to the west of Swamy Pushkarni. The great religious leader Ramanujacharya visited this shrine on a pilgrimage and systematised the process of worship in accordance with the SriVaishnava that continues to date.The Puranas associate the site with Lord Varaha, one of the Dashavatara of Lord Vishnu. The Varaha shrine holds great importance in Tirupati and is said to be older than the main sanctum of Venkateswara. There is also the Ranga Mandapam, which is to the left side of the temple as one enters. Thondaman, ruler of the ancient Thondaimandalam (present day anchipuram), is believed to have first built this temple. He built the Gopuram and the Prakhara, and arranged for regular prayers to be conducted in the temple. The Pallavas of Kanchipuram (9th century AD), Cholas of Tanjore (10 century), Pandyas of mathura and Vijayanagara pradhans (14th & 15th centuries) were committed devotees of Lord Venkateswara. The statues of Sri Krishna Devaraya and his spouse stand in the premises of the temple. After the decline of Vijayanagara Empire, kings from various states like the king of Mysore and Gadwal, worshiped the lord as pilgrims and gifted various ornaments and valuables to the temple. Raghoji Bhonsle, the Maharastrian commander visited the temple and made a permanent arrangement regarding the regular pujas to be done to the Lord. In 1843 the temple gave up administrative authority of Venkateswara Temple along with the temples in the village to the head of Hatthimji monastery in Tirumala. Till 1933, the administration of the temple had been wielded by the head of that monastery, Hathiram Mahantha. In 1933 the Madras government appointed a Commission to Tirumala Tirupati Devasthanam through a special statutory authority to run the administration of the temple. In 1951 another Hindu Religious and endowment Act was made which felicitated the appointment of an executive officer and Board of trustees and they run the administration. The executive officers of this institution in the South have been maintaining administration.The daily operation and management of TTD is the responsibility of an Executive Officer (EO) who is appointed by the government of Andhra Pradesh. Other than the Sri Venkateswara Temple, there are places which can be seen in Tirumala. Srivari Paadamulu: Srivari Paadamulu (means Lord Balaji's foot prints) is believed to be the foot prints of Lord Venkateswara, when he first stood on Tirumala hill. The foot prints are located in the highest point of the hill. It is located about 15 kms from the temple. Natural Stone Arch: The Natural Arch is a distinctive geological wonder located 1 km north of the lord Venkateswara's temple. The Arch is also called Silathoranam in local language. The arch measures 8 m (26.2 ft) in width and 3 m (9.8 ft) in height, and is naturally formed in the quartzites of Cuddapah Supergroup of Middle to Upper Proterozoic (1600 to 570 Ma) due to natural erosive forces. The arch is one of the few natural arches or bridges in Asia. Akasa Ganga: Akasa Ganga (Akasa means Sky and Ganga means Stream) is a natural waterfall believed to have its source in Lord Vishnu's feet. The sacred water is used daily in Srivari Temple's activities. Japali: The Japali Teertham & Hanuman temple 10 km.The Hanuman temple at Japali is one of the least known and most worthy places of visit in Tirumala. After a kilometre's trek into the woods, the darshan of lord Anjaneya is really a memorable experience. There’s a lake in thick of the woods and nothing like just sitting there listening to the chirping of birds and splashing of water. It is said that Lord Rama with his consort Sita and brother Lakshmana stayed here along with Lord Hanuman. There is a perennial pond, called as Rama Kund, in the temple premises that was said to be the source of drinking water, during their stay here. There is a water source flowing to this place and it is not known where the water comes from. 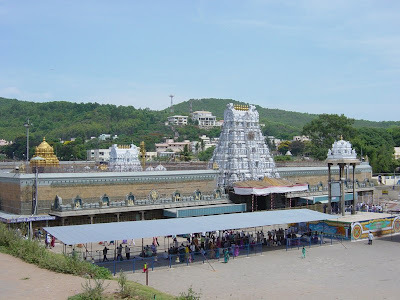 Paapa Vinaasanam: Paapa Vinaasanam is a temple located about 8 km from the Tirumala Temple. The temple of Goddess Ganga is said to forgive all the paapam (sins) we have done in our life till now. Kalyani Dam: This is a dam about 18kms from Tirupati and falls under Rangampet forest. is dam is the main source of water supply in Tirupati and Tirumala. It is a nice place to visit and is like a picnic spot for recreation.